Polo Gallery MIchael Chevis Photographer, Midhurst, West Sussex. Wedding, Commercial, Photography. was by goal judging at Cowdray Park in the summer holidays while at school. Then in his teens would help exercise the ponies as well. So when he became interested in polo it was only natural that he should photograph the "Sport of Kings." Since then he has been commissioned by many equestrian and national magazines to photograph polo at all the major polo centres in England, with visits to St. Moritz to cover winter polo, played on the frozen lake. Michael is the official SUPA and Pony Club Polo photographer, and on many occasions has been the sole photographer to photograph events when members of the Royal Family have been on the field, notably when the young princes were playing for Eton, or at invitation only matches to raise money for various charities. 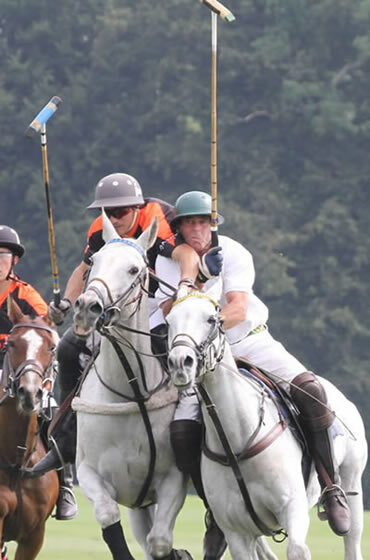 Cowdray Park Polo Club has commissioned Michael to cover days when Princes Charles and Harry have visited to play. And more recently have commissioned him to be the major contributor to illustrate the centenary of the club with a stunning coffee table book, available summer 2011.